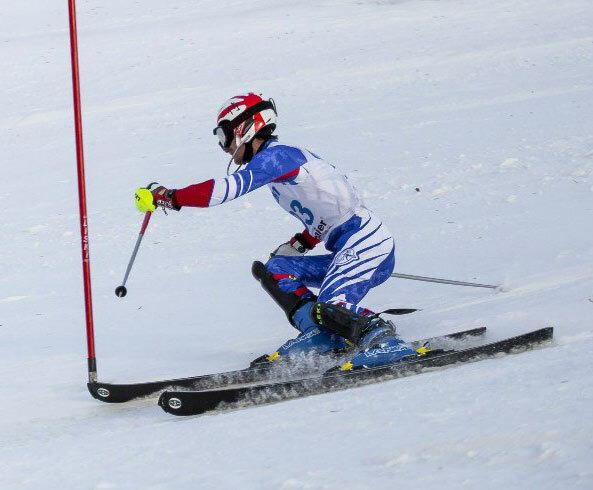 I want to tell about the Japanese ski Ogasaka, more exactly about slalom ski Ogasaka Triun SL. I’ve tested it first time a few years ago, and now come to switch to these skis. It so happened that in our ski club rides great enthusiast Shigeru Iwamoto, whom I’ve met first time about 20 years ago at ski competition in Moscow. That time I’ve been working in Moscow office of the Japanese company. We discussed with Japanese colleagues various topics including about skiing. I did a couple of conclusions. The first one is not associated with skiing. I realised for myself that population of Japan and Russia is about the same. Shortly before this was still the Soviet Union, so I operated in mind figures of population for the whole of Union. And when finally rebuilt brain to “only Russia,” it just coincided with this comparison. It is fact but still, it’s strange. This is a huge difference in the territory of Russia and Japan, while the population is the same. And not the whole territory of Japan is well suited for a comfortable life of man (the same as in Russia). The second conclusion was that skiing is very popular in Japan. Much more than we have here in Russia. And not only in Russia. By the number of regular skiers Japan was (at that time and may be is now) at first place in the world. And that was strange, because Japanese are not so famous at Alpine World Cup. So, what I want to say: Japan has huge domestic market for skiing, so they might produce a very good ski equipment, which is almost unknown outside of Japan. So I was not surprised when noticed Japanese skier at Moscow open competition. However, it should be noted that Iwamoto san is the only of a significant number of Japanese working in Moscow, who takes part in the Moscow competitions. For Iwamoto san skiing, as well as for us is a hobby. I am deeply sure that we know here about Ogasaka ski only because of enthusiasm of Shigeru Iwamoto. Iwamoto san brought to training some skis for testing, for the giant and slalom. Skis were quite impressive in comparison to our “traditional” european brands. After immediate change to Ogasaka time of run very often became better to 0.5 s at 20 s course. Pretty soon colleagues from our club began to order Ogasaka ski. Alexey Yolkin, for example now have five pairs: two for slalom (old and new), two pairs for giant (27 and 35 m), and one for SG. Ogasaka ski, of course, became known not only in our club. Iwamoto san promote them in different directions. 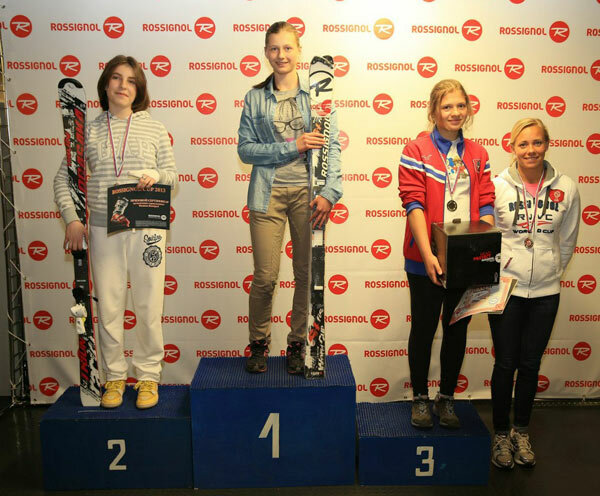 Gradually ski began to appear on the podiums of amateur competitions. There was published a qualitative review. 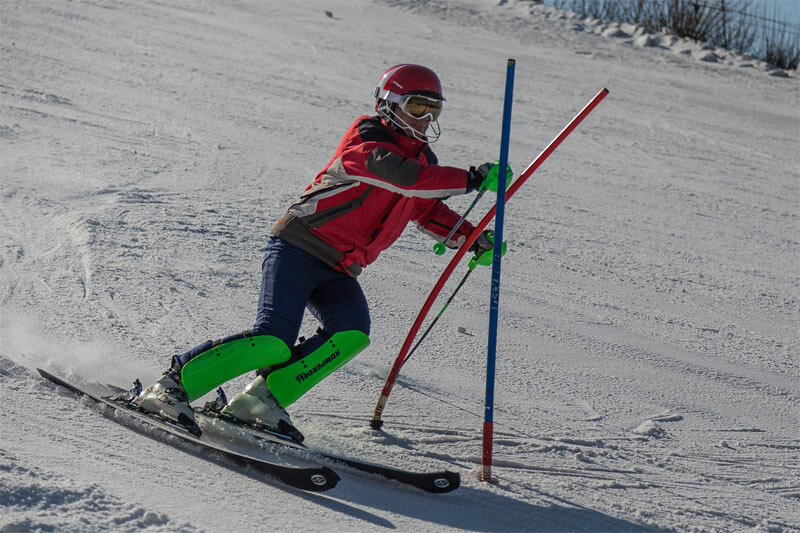 SkiGu.ru tests slalom skis 2013-2014. Ogasaka Triun SL (in russian). However, our colleagues, who have long use Ogasaka were strongly disagree with the conclusion of too soft edges. I have not switched to Ogasaka ski because of several reasons, the main of which is that my progress is not limited by brand of ski. So I need to achieve some level of skill before. But I tested ski of each model year and watched to others. 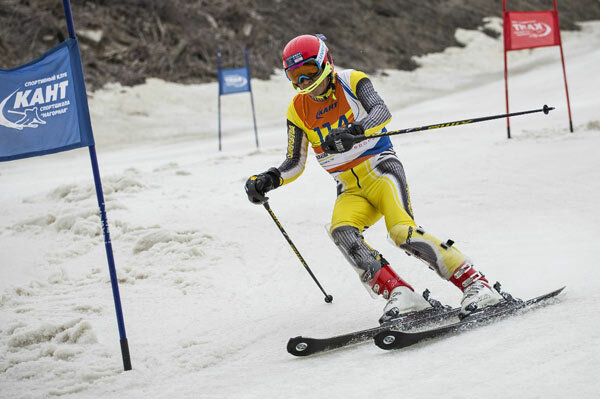 At Moscow competitions Ogasaka ski became more and more famous. Such a picture can often be seen. Now about the “Newton’s apple.” Unusual warm week in March completely killed the snow on slopes. More precisely, snow was fully transferred to the ice in the form of groats, if a small negative temperature (Celsius) or a kasha (porridge) if small plus. All this on the wet ground, to which was only 30 centimetres of such substance. So season was rapidly moving toward to completion “not according to the calendar.” But suddenly hit frost to minus 10 C, and the coating has committed yet another transformation – to the hard ice shell (glass like ice 30 cm of deepnes from surface to ground with temperature of ice about minus 10 C). Quality of such ice hard shell on our training slope was not very good because of sand and ground abrasive within ice. 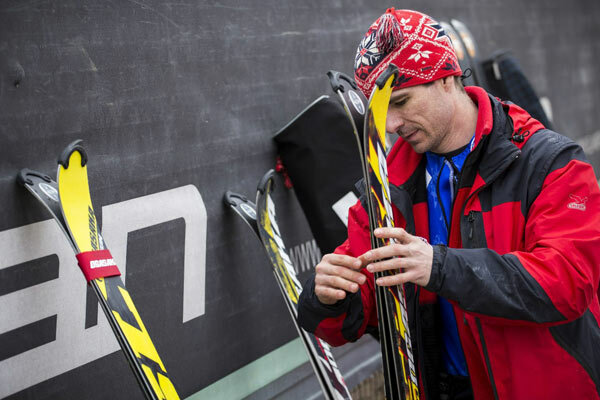 In order to save edges in main ski Atomic (SL about it in this article) I began to take the second ski, almost ground off Fischer. To the next training I again took two pairs of skis, Fischer and Atomic, sharpened equally well. 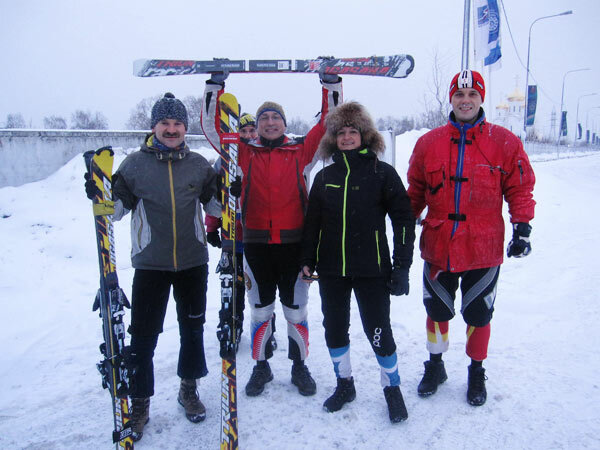 We installed slalom on the same ice shell as in competition. A colleague from our club Vasily Zeyfas, who also suffered on Atomic of previous model year, took as second pair old worn-out Blizzard. The picture was completely repeated. It was not real to pass slalom track on Atomic. In detail, it looked like this. At the entrance to the turn ski good clung by wonderful atomic’s toe, but then a part of ski from top to binding looks like not present at all. Not for long time, but enough to go on ice so far away from trajectory, that return can only by sideways. On the other brands of ski, and we have that day SL Fischer, Ogasaka, Stöckli and Blizzard so was not. We change ski to make sure that it was because of Atomic ski not because of lack of skill. There are some reasons why this might be, but looks like this is design feature of this model Atomic, which has tenacity and flexible toe and too large cutout in the area from the top to the bindings. What I do not like is that this kind of hard low-temperature ice just showed this design feature. So such a pause in conducting of curve is present on any surface, but just not seen so clearly. 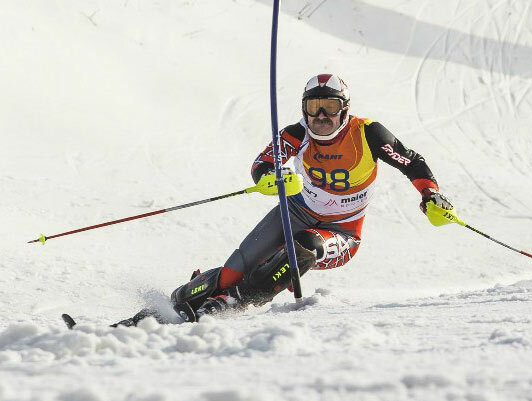 You can not notice it because of doubts of skill or consider that such a general feeling of uncertainty is an integral part of alpine skiing. On the same day Iwamoto san gave me for testing ski Ogasaka Triun SL of previous (2014-2015) model year. 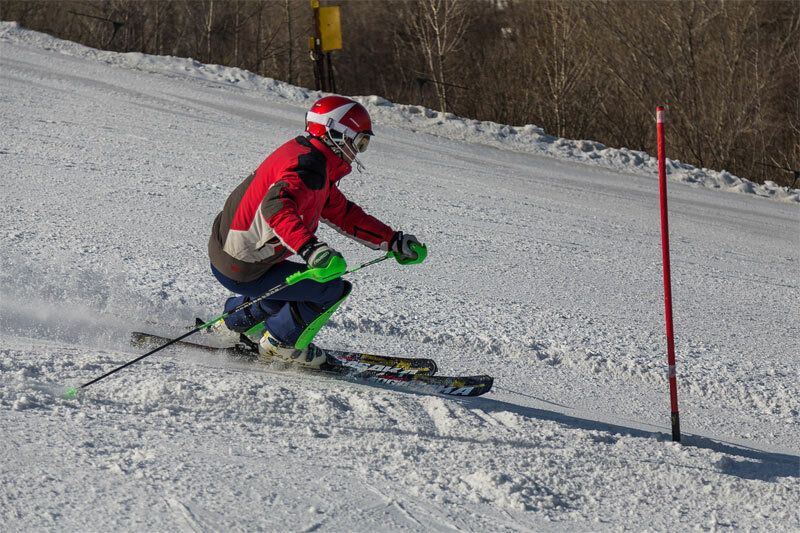 I tried it for two days in the free skiing and on the slalom track. I can not do clean comparison because ice shell was already covered with dense artificial snow by cannon and ratrak. When this layer on track was cut to ice, it still remain groove that keep ski on track. Therefore, by subjective sensations I can only note that the skis differ from Atomic and from Fischer, but I knew it before. It is necessary some more days to get used to it. Overall, I enjoy skiing right now, work in the arc has become more “solid”, but this can only be seem. From objective parameters I’ve compared the shape of the sidecut. I tried to find why Atomic not held, my assumption was that because of they have more sidecut in the front half of ski and more bright overall “hourglass”. Indeed, the ski Ogasaka Triun SL show much less of sidecut. The width of the toe and the heel is the same, while the “waist” is more. Therefore, the front part of the ski, as corresponds to sensations, is more close to rail, lie down to snow when ski is not so much bent in an arc. 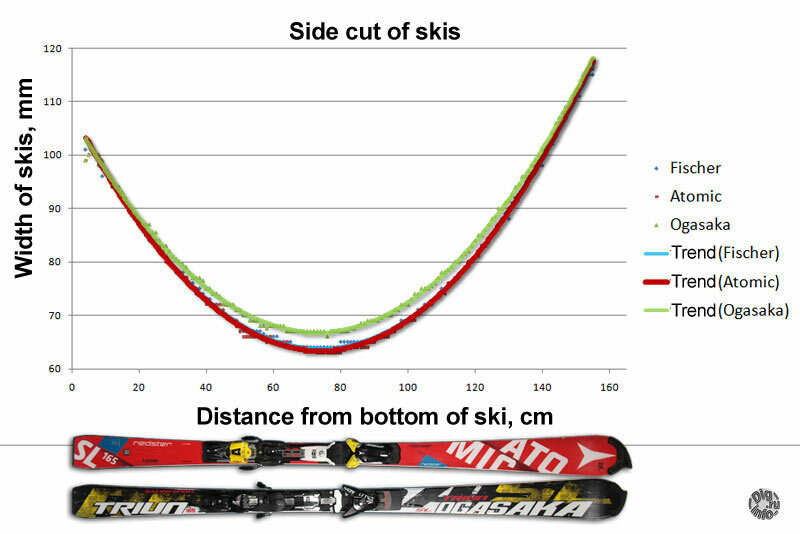 For clarity, below is the difference in the width distribution of the length of the ski “Width of Ogasaka minus the width of Atomic” (marked in red). 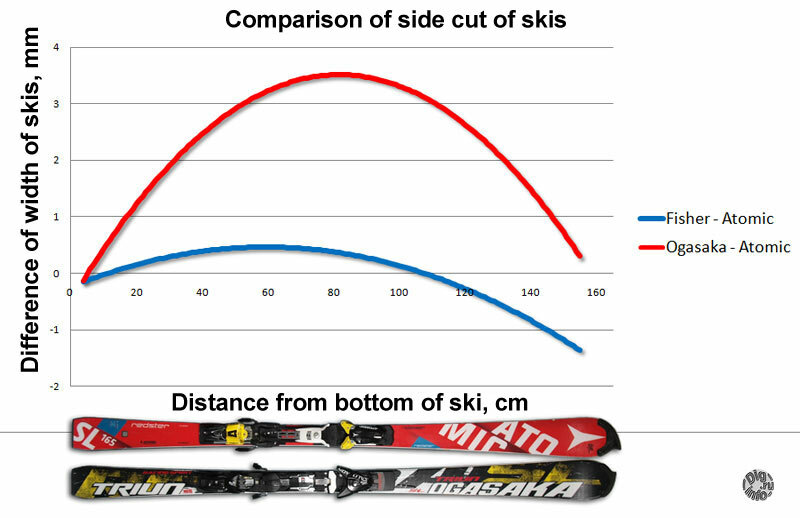 Unfortunately, it is hardly possible to draw a clear conclusion from the form of sidecut because to the measurements were involved also Fischer skis that kept on ice, while the geometry as was measured is almost like Atomic, the difference is within 1 mm – so less then wear of edges. But from the second graph (blue), one can conclude that Fisher is also not such a radical cut-out like Atomic. On the fourth day of testing I’ve realised that new opportunities appears for a more precise prediction of the trajectory, and indeed the unity of the trajectory has become much more noticeable. So obviously for quality test it would be good to test the skis a few days. In just a few descents, as it usually happens in the test it can be good to note only how those skis differ from skis on which you ride. 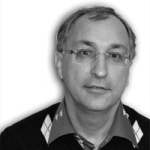 On a slope Viacheslav Martynov employee of test center of Elan, Blizzard practiced photography, here are a couple of his photographs.